With their sunny days and warm temperatures, Florida beaches are some of the best beaches in the world. From the Atlantic to the Gulf, Florida beaches come in all shapes and sizes. Some beaches are quintessential “old Florida” with an easy-going and relaxed vibe, while other beaches boast dining and nightlife that will satisfy the most discerning visitor. 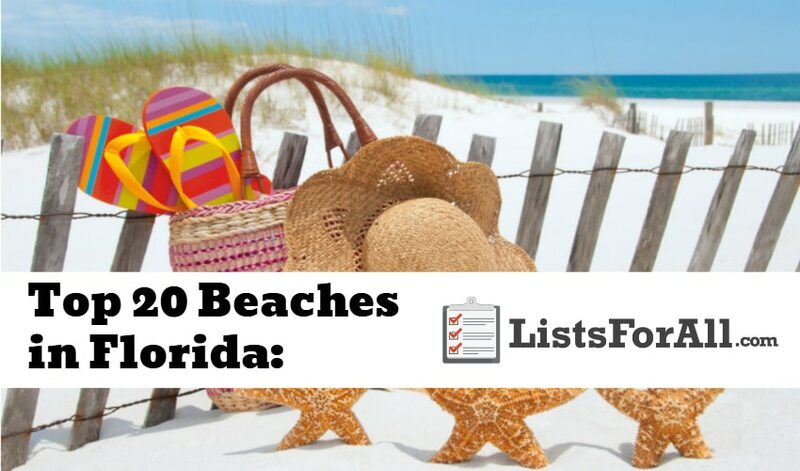 No matter your budget or taste there is a Florida beach for you on this list that is going to fit your needs. Read on and choose the beach (or beaches!) that best suit you! After that check out our list of the best travel sites and book your trip to one of these great beaches. Less built-up and “touristy” than many other beaches, Anna Maria Island offers a homey and idyllic beach destination. Visitors looking to get away from the hustle and bustle typical of many beaches will appreciate Anna Maria Island and all it offers. With its old Florida charm and its delicious seafood, Anna Maria Island is not to be missed. Sanibel Island, along with nearby Captiva Island, is a gem among southwest Florida beaches. Bike trails, unique dining, and shopping options all help to add to Sanibel Island’s relaxed and picturesque atmosphere. The island also boasts a wildlife refuge that visitors can explore. A short drive west of Tampa, Clearwater Beach is a perennial favorite with beachgoers. Home to Winter the dolphin, one of the best resorts in Florida, and clear gulf water, Clearwater Beach has something for everyone. Be sure to check out some of the top-rated dining establishments lining the beach as well. Everything from freshly caught grouper to upscale fine dining is available. Located in northeast Florida, Amelia Island is both picturesque and inviting. Between the famous beach horseback rides and Segways, taking in the island’s scenery is a breeze. Historic bed and breakfasts and unique boutiques add to the charm of Amelia Island. Voted the best family beach in the US by Parent magazine, Fort De Soto North Beach is the perfect laid-back Florida beach. Just south of St. Petersburg, the beach is part of the Fort De Soto Park, a group of five islands complete with a museum and fort. In between exploring the history of the fort, beachgoers can find shells of all shapes and colors on this beach, making it perfect for shell enthusiasts. Panama City Beach consists of 27 miles of beachfront. All of this beachfront is going to allow you to be part of the crowd or find your own secluded stretch of beach. If you love activity and people, Pier Park is going to be perfect for you with its numerous shops and restaurants. Regardless of where you go on the beach though, the powdery white sand and changing blue color of the water are the real draws of Panama City Beach. Home to the Daytona 500, Daytona Beach is equally famous for its amazing beaches. With great resorts, restaurants, and even amusement rides, Daytona Beach offers something for everyone. A great family spring break destination, Daytona is a great beach town that is enjoyed by the locals as well as guests from all over the world. Located between Boca Raton and West Palm Beach, Delray Beach is a worthy beach all on its own merit. With first-class resorts, great dining, shops and more, Delray Beach offers plenty of activities. Now add in the scenic beaches and calm, refreshing water, and you have a mix that is sure to entice beachgoers from all over. Looking for the island life? Caladesi Beach is on one of Florida’s few remaining undeveloped barrier islands. Accessible only by boat (don’t worry there is a ferry that will take you there if needed), Caladesi Beach is going to be perfect for those wanting a quieter beach-going experience. Add in a kayaking trail and plenty of nature trails, and you will be able to go exploring as well as sit on the beach and soak up the sun. St. George Island is another of the island beaches on this list. It is going to offer miles of uncrowded beach that is going to be perfect for relaxing or exploring. Also, the island does not allow high rises or chain stores. So you can trust that the views are going to be unspoiled by buildings. You will be able to experience the feel of a great beach without the overdevelopment that accompanies some beaches. St. Augustine Beach consists of 42 miles of beachfront. The beachfront consists of smaller beaches that are going to allow you to pick and choose according to your preference. Whether visitors are looking for a charming beach community feel or want to sit and enjoy the beach with no one around, St. Augustine Beach is going to offer something for everyone. Florida boasts 10,000 islands and Marco Island is the largest of these islands. Marco Island is located on the Gulf of Mexico and consists of sun-washed white sand beaches, tranquil waters, and an easy paced feel. Marco Island also offers first-class resorts, shopping, and plenty of great restaurants. Located on Florida’s white-sanded Gulf Coast, Venice Beach consists of 14 miles of beachfront. Perfect for sunbathing, swimming, fishing, and more, you will be able to spend all day enjoying the beach and weather. Add in the Italian architecture of the city (where it gets its name from) and the great golfing, and it is easy to see why Venice Beach is one of the featured beaches on this list. For a less crowded atmosphere than nearby Miami Beach, Fort Lauderdale is the place to be. Clean white sand abounds here, and the dining strip is truly special. Rent a bike and cruise the boardwalk to experience all that Fort Lauderdale Beach has to offer. With its sugar-white sand beaches and emerald-green water, Pensacola Beach is a favorite with many. Its laid-back vibe and variety of activities make it a relaxing but fun beach destination. Pensacola Beach also offers an educational and informative Eco-Trail where visitors can learn about local plant and animal life as well. Part of Miami Beach, South Beach is renowned for its nightlife and white sand beaches. Its iconic shopping, dining strip, and Art Deco buildings that have been featured in many a film and television show also highlight the appeal of South Beach. South Beach’s beautiful shoreline and nightlife make it an ideal beach for those looking for a good time. An easy hour drive from all of the Orlando attractions, Cocoa Beach is home to one of the largest surf shops in the world. And for a good reason too! Cocoa Beach’s location on the Atlantic side of Florida allows surfers to catch better waves than they would on the Gulf side. The beach’s proximity to Port Canaveral, a leading cruise port, will also enable visitors easy access to the Caribbean. Located in southwest Florida, Siesta Key Beach is consistently rated as one of the best beaches in Florida. Its relaxed vibe and soft, white quartz sand make it a family favorite year in and year out. While there, be sure to get in some fishing and have some ice cream from one of the many delicious ice cream shops. As the southernmost tip of Florida, Key West Beach is a taste of the Caribbean. There are many activities to choose from: kayaking, world-class fishing, snorkeling, and boating. Key West also has an active nightlife, giving visitors something to do almost 24/7. Initially, a barrier island located off of the Florida panhandle, Destin Beach is now connected to mainland Florida. As part of Florida’s “Emerald Coast,” its emerald-green waters attract visitors from near and far. There are plenty of activities to choose from at Destin too. Some of the fan favorites though are dolphin watching and a thriving art and entertainment scene. With 1,350 miles of coastline, it is pretty easy to see why Florida has so many quality beaches. On both the East Coast and the Bay Side of Florida are a variety of great beaches to choose from. All of this variety will allow you to find a beach that speaks to you. Have you been to any of these beaches? Let us know how it was in the comments below. Primordial sala de Trivial de las varias que hay en esta joven red de IRC.